heh, it will be a heap of fun for sure. dem sock monkeys take longer to make than i expected. at least i can put my old socks to use. all the singles and ones with holes.... hurrah. He looks very evil, too! All I can say is: Thank God Penny is no longer staying at Dagmaraka's place! heh, he's a good little monkey...although to me he looks mostly like my old socks that i loved. i got them when i got back from india the first time....took me 3 weeks to readjust to 'western' life, i was cold and depressed. 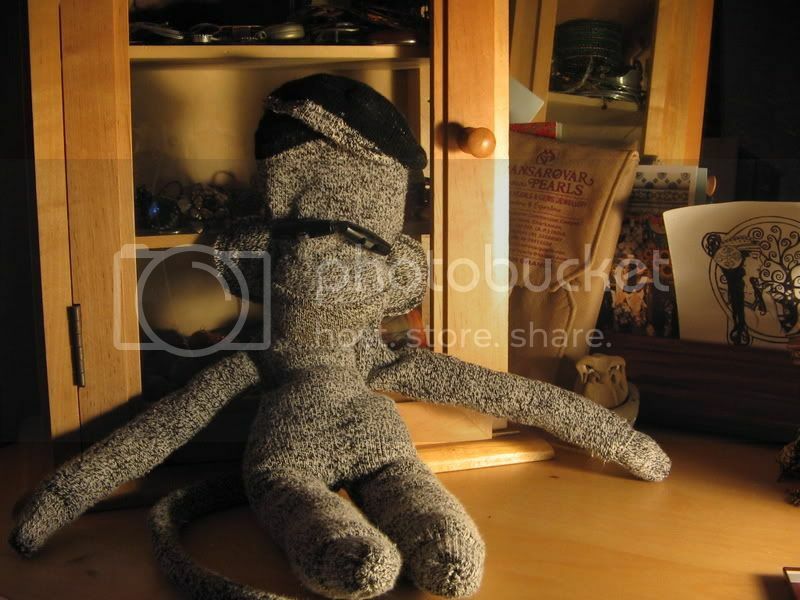 i took great comfort in those socks in the solitude of my room... now they are an evil sock monkey and will go on stage and then live in a backstage room among other props and wigs and costumes and makeup. i guess it's a good fate for memorable socks. Memo to Kris: the Man of your dreams just got hitched !!! He's beautiful!! Was that a pre-nuptual or post-nuptual shot? Ryan looks splendid as well. well, that's so them. i thought it was a brilliant capture of the newlyweds. ...though there should also be one with R. in a hissy drama queen fit...i digress. I agree about needed to balance the dramatic tendencies there.